I have spent the last five weeks trying not to focus on my next clinic appointment. 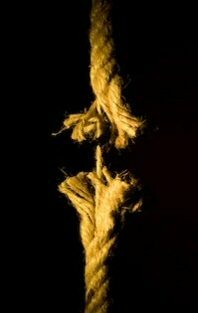 The trend in my light chains seems all too predictable, and the aching in my ribs more persistent. This week’s appointment was never going to be straightforward. Dr Crapulous had booked it on an off-week, and my blood tests had been posted to a previous appointment. The phlebotomy department ace their part of the test. But sure enough, when I arrive in the clinic, my name appears on no appointment list. My clinical trial coordinator comes to speak with me. I explain that DrC was insistent, last time, that today would be OK.
“‘I’m always here’, he said,” says I. She gives me one of those NHS-sympathetic looks. “He’s on annual leave”, she tells me. So they put me on the end of someone else’s appointments list. A doctor I’ve never seen before. And then I wait. After two hours, my myeloma clinical nurse specialist walks past me. “You’ve been waiting a very long time”, he says. So that’s what we do, and I don’t see the doctor at all. The print out comes as a bit of a surprise. My neutrophils, while still low, are up a little – certainly no greater cause for concern. 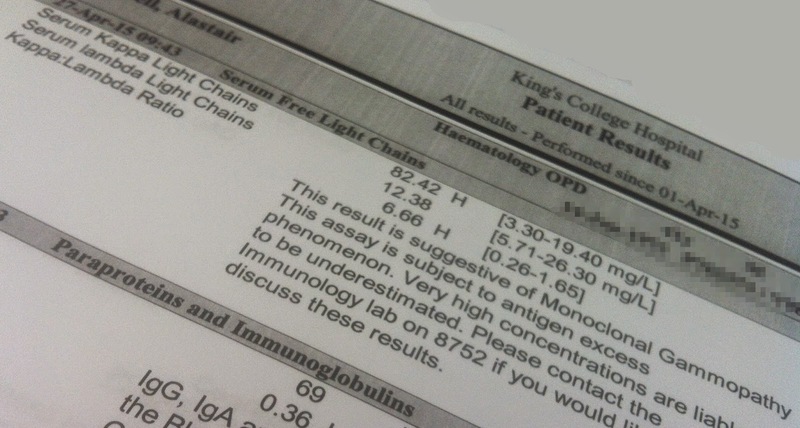 My haemoglobin is normal. And much to my surprise, my light chain levels are completely unmoved from five weeks previous. Though the κ/λ has deteriorated, because the λ figure has dropped, which could be ominous, or could be meaningless. The Sword of Damocles* swings filipendulously above my head. * In the original Greek telling, the Sword of Damocles represents the ever present peril facing those in positiongs of power. It is something of a subtle shift that it has come to symbolize, in a modern setting, the sense of foreboding caused by any precarious situation. My most recent check up was simultaneous with the massacre in Tunisia. This fact makes me feel a little uncomfortable dwelling on myself. And I know others, too, much closer to home, are dealing with challenges no less daunting than mine. I’ve hesitated to write this post. But I want DialM to be a faithful transcript of my myeloma, and regardless of what else is happening, my hospital appointments don’t stop. So, take or leave what follows. I can’t promise you’ll learn much! And sorry if it is a little complicated. On this Friday morning, for the first time in a long time, the consultant doesn’t just tell me that my blood test results are all good. For the last few months, even as my kappa light chains (KFLC) have crept up, he’s considered it no real cause for alarm, because the ratio (κ/λ) has been static. At low levels, this is significant because there are reasons other than myeloma which could result in raised light chains (particularly, kidney function). But my myeloma only produces one type of light chain (kappas, κ), whereas any other cause would affect both types (kappas and lambdas, κ and λ). While the ratio is static (even though it is abnormal) that is indicative that not much is happening myelomawise. This time, though, the ratio (for which normal would be 0.26 < κ/λ < 1.65) has jumped from 6.5 to 15.2. I’m not sure what this means – and nor is the consultant – because it is largely due to my lambda levels dropping. Active myeloma would certainly cause that by crowding lambda producing cells out, but I’d expect to see things like anaemia and neutropenia developing simultaneously, which hasn’t happened (yet). And anyway my kappa levels haven’t spiked. Which triggers a conversation about what would be considered progression. The answer, in a nutshell, will be when the difference between my kappa and lambda counts has increased by +100 from the minimum I achieved after SCT, and that will be when my KFLC = c.160. Some way to go. However, for the first time the consultant acknowledges that, with occasional exceptions, my KFLC score has been increasing slowly for some months. I face the reality, again, that it is a matter of when, not if, my myeloma progresses. How long might that be? He doesn’t think it will come in a jump. I can’t help making mental estimates of how fast the KFLC score is moving. My most negative estimate is about +10 each two months, of late. At that rate, I have a year. Or, taking a more optimistic view, it has increased +40 in the two and a bit years since my SCT. At that rate, I have 3 years. So… hold the front page… my myeloma will probably be back somewhere between 1 and 3 years from now. But then, ever since we knew my SCT had been successful, we knew that, really. Can’t say I’ve enjoyed being reminded, though. It’s a burden, being responsible for making good on remission. How can I ever live up to it? How much must I make, of every moment? And if I have a mundane day, an unproductive day, a miserable day, what kind of betrayal is that? These thoughts can be quite debilitating. Knowing life is finite, and hard earned, and yet still being miserable. That’s a toxic combination. For a while, last year, I was really very down. So it is good that the other thing that is creeping up, is the frequency with which people tell me how well I look. In part, this is a consequence, I think, of adopting a somewhat cavalier attitude, to life, to responsibilities, to myeloma. I’ve excused myself, for now, from the responsibility to take it all seriously. I’m not trying too hard to make the most of it. I live under the shadow of a ratio. 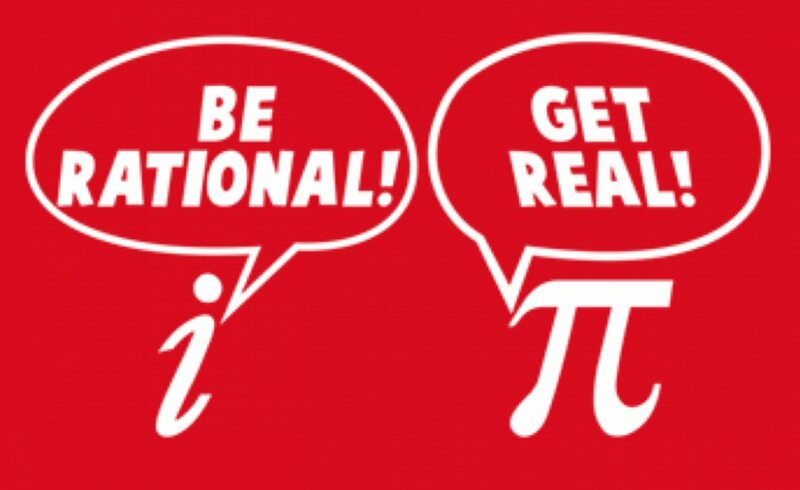 I’m permitting myself to be a little more irrational, while I can. I deliberately left DialM quiet for the whole period, so you could share the experience. (I had to restrain myself a little.) I don’t know if you’ve noticed the absence? Were you wondering about me? Or had you stopped thinking about it? I’d like to say I stopped thinking about it myself, but that would be a fat lie. My spine always reminds me, as does my ongoing calcium deficiency. And there was a wobble a couple of weeks ago when I caught the tail end of a child’s infection and had several days of fatigue (and presumably anaemia) as a consequence. However, these are but small grievances. My light chain score is up a little today. I do wish it would go down again a bit next time! It’s not really a trend though since the κ/λ ratio is steady at around 6.5. I can’t be bothered to explain that to you. If you have mm, you’ll know what this means. If not, you’ll have to do your own research! Or just let me paraphrase for you: “This result is suggestive of a summer holiday”. I’m signed off for another 2 months. I’m realising, as time goes by, that these check-ups form planning horizons in my life. I can just about make plans 2 appointments ahead, but that is really all. It is looking pretty promising, given my results today, that things will still be OK at the end of June. In which case I get to have a summer holiday. But I can’t make firm plans further out than that. I’d really like to take the kids travelling for a bit at the end of the year, but I won’t know if that’s an option until after check-ups somewhere in early September and early November, or thereabouts. It is strange to have to plan all my choices around my light chains. But such is my lot. If things are still good in February, then I want to get a puppy! Reluctantly, I tell the consultant about the pain I am getting in my left hip. It has been getting quite bad. Inevitably this leads to an appointment for an X-ray – I just can’t tear myself away from the hospital, can I. If I know my own body then the X-ray (which I had on Monday) will show nothing. But always better safe than sorry, with mm. So, I’m not expecting a call when they’ve reviewed the X-ray. And I’m hoping not to go to the hospital again until April. 2 whole months away! Imagine!